How was the Flexcushion Born? Our President & Founder, Nao SAKATA, when he was a member of the Sumo Team at Rikkyo University, had difficulty with Sumo's MATAWARI (splits) training, which was essential for Sumo. Later, he found it easier to stretch when he sat on the Dohyo, a straw bag (5cm / 2 inches high), which is now the front height of the Flexcushion. 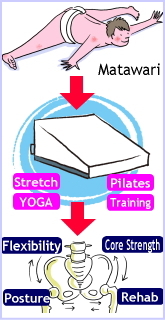 With advice from Professor Hideo NUMAZAWA (Rikkyo University), Nao SAKATA developed the Flexcushion. See the detail at our corporate page "www.flexcushion.com/about"